The Eversole-Hall House is named for two of its former owners: Charles Eversole and Abraham Hall. Eversole was a German immigrant and weaver by trade, who arrived in this country in 1753 and built the original portion of the house. After Mr. Eversole's death, his grandson eventually sold the house and a portion of the surrounding land to Abraham Hall, a farmer and shoemaker, who enlarged the house and added a second story. The house remained occupied, without indoor plumbing until 1988, when the Township purchased it. After renovation by community volunteers, it opened as a museum in 1991. 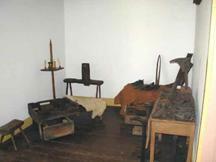 The house is used to interpret life in the 1830’s. Though the exact construction year for the oldest portion of the house cannot be definitively dated, the house does appears on the map of Revolutionary Roads drawn by Robert Erskine, George Washington's cartographer in late 1770’s. 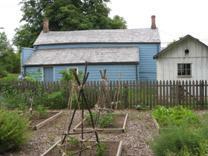 There are a number of outbuildings and important work areas at the back of the house. Just outside at the back of the house is a hand pump, which still provides the only source of water to the house. The little white house next to the main house is the wash house, as well as a privy, or outhouse. Even though the house was inhabited until 1980, it had no indoor plumbing - the outhouse was and is the only restroom on the property. The addition added by Hall is currently set up to reflect a shoemaker’s shop. Since Hall was a farmer as well as a shoemaker, he most likely would have worked in his fields during the day and in his shop at night. The shoes he made and sold provided an additional source of income for the family, as well as a source of goods that he could use to barter for services or goods not produced on his farm.